I'm truly ecstatic and honored to be hosting a Botanical Knits giveaway today! By now you just have to know that I'm an Alana Dakos of NeverNotKnitting fanatic/devotee/enthusiast, possibly could be called a NNK maniac! Alana's newest collection is beyond breathtaking. Words can't describe what the twelve Botanical Knits patterns do to my little knitting heart. I stalk the patterns on Ravelry regularly, along with so many others, I'm sure! This pullover is just perfect! I intentionally knit this sweater smaller than the smallest size with some mods (all listed in my pattern notes) on purpose. I was trying to perfect the changes that I wanted to make for my larger size, and I'm really happy I did. Jasmine loves her sweater and has worn it several times already. The pattern is beautifully written, easy to work from, and kept my attention the entire time. I knit this thing in 5 days flat - granted it was a really small version of the sweater. I ended up choosing to use some Silky Wool from my stash for this project (which I think worked very well for this earthy leaf design), but I'm really itching to knit this sweater for myself out of the original yarn Alana chose for the book, Berroco's Ultra Alpaca Light. The UAL is such a gorgeous yarn and has such a beautiful palette of colors to chose from. Now, if only I could pick just one! Alana says, "Knitters can order the printed copy for $22 + shipping. As a special thank you for preordering the printed copy, they will get the e-book for free immediately so that they can start on their projects. The printed book will ship mid-May. They will also receive an exclusive extra botanically inspired garment pattern with the copy of their printed book as a thank you from me for preordering. OR They can just order the e-book by itself for $18. This is a great option for those knitters who live internationally and do not want to pay the high cost of shipping. After the pre-order period ends in May.. the book will be available EITHER in print for $22 or e-book for $18. There will be no digital and print bundle offered." TWELVE skeins of Berroco Ultra Alpaca in the yummy Candied Yam Mix color. That's enough to knit either the largest size of Autumn's End, or you could knit a smaller size and use the remaining skeins for some Spring Foliage fingerless mitts! FOUR skeins of Classic Elite Yarns Magnolia in a luscious color called Terra Cota. That's just enough yarn to knit yourself a Wrapped In Leaves shawl. ONE skein of Miss Babs Cosmic Hand-painted Sock Yarn in a stunning color named Biker Chick. You can either knit yourself a pair of Ivy Trellis Socks or the Ivy Trellis Mittens. Then there's ONE skein of Madelinetosh Tosh Merino DK in the Magnolia Leaf colorway for a beautiful Pressed Leaves of your very own. And, finally a squishy lovable skein of Blue Sky Alpacas Suri Merino in the earthy Harvest color to knit up a Forest Floor hat. BUT, that's not all! We had such a huge response from sponsors about this giveaway that there's another "bucket full" of yarn that I sent along to Alana who will be hosting an additional giveaway on her NeverNotKnitting blog later this week, which will include: enough Brooklyn Tweed Shelter to knit a Twigs and Willows, more Berroco Ultra Alpaca Light in another color, more Classic Elite Yarns Magnolia, more Miss Babs Cosmic Hand-painted Sock Yarn, and additional yarn from the book's projects. Between the both of us, I think we got the whole book covered!! Be sure to check Alana's blog for more details in a few days. Thank you to all the fantastic sponsors and Alana for putting together a giveaway to remember on YOTH! 2. Leave a comment on this blog post by the end of Sunday, 3/10/13. Which pattern is your favorite in the Botanical Knits collection? Alright, I'm kidding, you can list your top three, since there's no way you could pick just one! Oh my goodness! What an amazing giveaway. My favorites are definitely Autumn's End, Forest Floor, and the Ivy Trellis Socks! I have been looking forward to this book, and I love the patterns. My favourites are entangled vines and oak trail. I made several little leaves already as they are a quick mini project. I've been looking at this collection for a while now, and I know I want to knit the Autumn's End, the Pressed Leaves hat and the Twin Leaf cowl. Thanks for such a nice give-a-way!!! You're right, there's no way to pick just one! My favorites are Buds and Blooms, Twigs and Willows, and Oak Trail. Amazing patterns, all, and what a generous lot of sponsors!!! Even three is too short a list, but I guess I'd say Autumn's End, Entangled Vines, and Pressed Leaves. Oh my goodness this is such a fantastic giveaway. My top three would be: Twigs and Willows, Autum's End, and Wrapped in Leaves. This collection is so amazing! I think my three favorites are Oak Trail, Twigs and Willows, and Pressed Leaves...but it's pretty hard to choose. Oak Trail is such a hip and different looking hat! Twigs and Willows is also very sweet! Gosh what an awesome giveaway! I love Oak Trail and Autumn's End. And as I love to knit up cardigans, definitely Twigs and Willows. Wow! 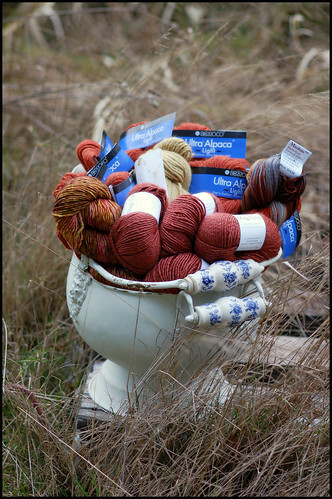 Great great giveaway, I love the picture of all that yarn. Only 3 choices? but there're 13 of them >.< I love Autumn's End, Entangled Vines, and Twigs and Willows. I love love love Buds and Blooms, as well as Twigs and Willows and Autumn's end. What a lovely collection! Love the bucket full of yarn. And really, all the patterns in this collection are lovely, but my favorites are the Ivy trellis socks and mittens, and the wrapped in leaves shawl. 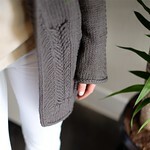 My two favorites are the Autumn's End pullover and the Twigs and Willows cardigan. The Ivy Trellis socks and Oak Trail hat are tied for third, but the whole collection is gorgeous. I love the entangled vines. The cardigan would be lovely to wear year round here on the west coast of B.C. Ooooh, so hard to decide! I think I have to go for Autumn's end, oak trail, and twigs & willows - so gorgeous! Oak Trail is my standout favourite, but I have been eyeing everything in this collection. What an excellent giveaway you've got this time! Entangled vines would definitely be my top pick. Seamless? Cables? Yes please. And maybe those hats, too...! Twigs and Willow, Oak Trail, and Ivy Trellis socks in that order. Love these designs! Still need to get cracking on some of her patterns from Coastal Knits. I like the Autumns Edge and the Pressed Leaves beret, and all the cardigans, too. I'd like to try knitting oak trail, the construction looks really clever. thanks for the chance to win. I love Twigs and Willows, Entangled Vines, and Autumn's End. I looove: autumn's end, wrapped in leaves & forest floor. well i love all the patterns !!! Love Autumns End, Oak Trail and Twigs and Willows. My favorite is Autumn's End, but I really like all the other patterns, too! You were not lying about not being able to choose just one! Even three is really pushing it. I would have never believed that something as simple and traditional as a leaf pattern could still be used in so many fresh and inventive ways! I rarely see books that have this many patterns that I would knit in a heartbeat. Nevertheless, my top three are Ivy Trellis socks, Twigs and Willows and Wrapped in Leaves. oh wow! this is such a terrific giveaway!! thanks to you all! my favorites patterns would probably be Autumns End, Oak Trail and Twigs and Willows but can I really decide? not sure! Entangled vines cardigan, Oak Trail hat and Wrapped in Leaves shawl... But you're right - I do love them ALL. I bought the e-book a day or so after it was released so I already have all the patterns but would just LOVE to get my hands on some of that yarn to knit up one of the patterns with! Oooh, I love nature patterns! Entangled Vines, Buds and Blooms, and Wrapped in Leaves are my favorites! I LOOOOVE Entangled Vines and Twigs and Willows best, and also those Tiny Leaves would make such a fun garland! oak trail for sure. This is an awesome giveaway! Thanks so much for the chance to win! Hmmm.. hard to pick just one. Entangled vines seems to be the perfect spring cardi though. Awesome giveaway! I just love Autumn's End, Twin Leaf Loop, and Entangled Vines. Oh, I love Oak Trail, Twigs and Willows, and Buds and Blooms. And and and all of them, really. I liked Alana's last book, but I absolutely LOVE this one. I am IN LOVE with Forest Floor, Buds and Blooms, and Entangles Vines...and everything else! Love this collection! It is always amazing to me how seeing a sweater in a different color or on a different model completely changes my view of it. I had thought Autumn's End was nice, but seeing it in the gorgeous gray you picked for Jasmine - oh! Love at first sight! Must knit! I absolutely love these patterns and the yarn is gorgeous! Would be thrilled to win this giveaway! My 3 favorites are the pressed leaves hat, Diana shawl and Magnolie mittens. Oh, I also would love to knit the paintbox socks. Socks are one of my favorite things to knit. Nothing like putting on a pair of handknit socks! I love, love, love, the Autumn's End sweater! They're all so beautiful! I'll be buying this ebook even if I don't win! The entire pattern collection is amazing, but my top 3 are Entangled Vines, Twigs and Willows, and Autumn's End. This might be your best giveaway yet! I think my favorites are Wrapped in Leaves, Entangled Vines, and the Ivy Trellis mittens. I love the Entangled Vines and Twigs and Willows sweaters. Just gorgeous! My favorites from the book are Wrapped in Leaves, Autumn's End, and Twin Leaf Loop. I would love to win a prize from this giveaway. My favorite is Autumn's End..and the Spring Foliage mitts and the Twin Leaf Cowl....hard to pick just one! I'm most looking forward to knitting Twigs and Willows. That cardi is so perfect for me. Simple with just a little bit of flair. This is such a great collection...I want to knit them all! Top three? Such difficult choices! i'll go with Wrapped in Leaves, entangled Vines and Forest Floor. I have to say, Autumn's End is definitely my favorite. And your version looks great on your daughter! The whole book has beautiful patterns, and I will have to take advantage of the pre-order. I particularly like the Pressed Leaves hat and Ivy Trellis socks. 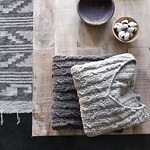 But the whole collection of designs is beautiful and the yarns used in the photos are such lovely earth tones. I liked Autumn's End, Pressed Leaves and Entangled Vines! Honestly, I like them all. i'm a sucker for three quarter length sleeves, so entangled vines is at the top of my list! twigs and willows is up there, too, because it looks soooo snuggly warm. thanks for the giveaway!! I think my favorite three would be Ivy Trellis Mittens, Oak Trail, and Twigs and Willows. Wow, awesome giveaway! And awesome patterns! I love Autumn's End, but also loving the Forest Floor and Ivy Trellis Mittens! This is an amazing collection. I love them all. Ivy Trellis socks are really great. I think I love all these patterns...but Autumns End is probably the one I would it first. Thanks for the giveaway. What an amazing giveaway! Thank you so much, thank you Alana and thank you yarn sponsors! I'm in a garment knitting mood, so my favourite designs are obsiously the cardigans and sweaters: Autumns ends, Buds and blooms, Entangled vines and twigs and willows. Entangled Vines, definitely, with the Ivy Trellis mittens and Oak Trail hat trailing slightly behind. They are all lovely! It's good you said top3, because I could not choose 1! My 3 favorites are: Oak Trail, Pressed Leaves beret, and Entangled Vines. Love them all but Buds and Blooms, Pressed Leaves and Ivy Trellis socks are my stand out favorites. Not sure if I can wait for the giveaway... I may order a copy for my mom just in case I don't win. My first attraction goes to Twigs and Willow, the ivy trellis mittens and the oak trail hat... just keep me head to toe in botanical bliss! Twigs and Willows is my favorite, but they're all lovely. Thanks for a great giveaway! How does one pick a favorite?? I am in love with Twigs & Willows... it would be perfect for work. I'm intrigued by Oak Trail. Entangled Vines is another work must-knit! Autumn's End, Forest Floor, and Twin Leaf Loop! But they're all so beautiful!! Hope I win! Love this book! Lovely patterns for my favorite season. Favorites are Autumn's End, Ivy Trellis socks AND mittens both. So cute! Entangled Vines, Autumn's End, and Twigs & Willows. All GORGEOUS. I hadn't seen these until I saw the Berroco fb post about the contest! What a great giveaway! Thanks! My favorite is the Oak Trail hat. Oak trails & twin leaf loop are my favorites from this collection! My favorite top three: Autumns End, because it looks so wonderfully cozy. Ivy Trellis socks, because I am a devout sock knitter and they look so textural and lovely. Spring Foliage, because my hands are always cold in the winter, and the little leaves will remind me that spring will eventually come. Buds & Blooms, Twigs & Willows, and Entangled Vines! Oh my, would love to win! I love the Ivy Trellis Socks, Pressed Leaves and Autumn's End. Thank you for the opportunity. Wow, what an incredible collection of patterns (and great giveaway)! My favorites are Autumn's End, Forest Floor, and the Ivy Trellis Socks. I've been waiting to buy this collection because I just love the Buds and Blooms sweater. If I had to choose one, that would be it. Of course, I'd also like to knit Autumn's End. Sigh . . . big sigh! I love all the patterns but if I had to pick three I would choose Buds & Blooms, Ivy Trellis Sock and Wrapped in Leaves! Thanks for the amazing give-a-way! I hope I win! My favorites are: Twin Leaf Loop, Wrapped in Leaves, and Autumn's End. My favorites are twin leaf loop, pressed leaves, and autumn's end, but I love them all! I love them all! my favorites are 3 sweaters. Autumn's End,Twigs and Willows and Entangled Vines. My favorites are Oak Trail and Pressed Leaves. I'm very into hats right now as I currently don't have any that fit my gigantic head! Wonderful giveaway - thank you! My favs are: entangled vines, ivy trelus socks, and wrapped in leaves. The only patterns I don't really care for in this collection are little leaves, and wrapped in leaves. The rest, I would be all over! My uber fave is the Oak Trail hat! Can I just say I want to knit all of them? I guess if I was truly pressed to choose only three I'd go with the Pressed Leaves Beret, Spring Foliage mitts, and the Autumn's End pullover. It is impossible to choose only one favorite! They're all beautiful. I love Autumn's End, Entangled Vines, and the Ivy Trellis socks. Gorgeous! I was so excited when I saw the patterns for the book popping up on rav! Can i just say i want to knit ALL of the sweaters? All. Of. Them. But if I could only knit one, it would have to be the Twigs and Willows cardigan. Alana's designs are amazing, so thank you for this wonderful chance to win! Such a sweet give-away and such a lovely collection of patterns. Autumn's end is my first-pick pattern, closely followed by Ivy Trellis socks and the Oak Trail hat. Oh, if only life offered more time for knitting! Easily Autumn's End. They're all really nice but that sweater is just so beautiful. I absolutely love this book! I don't know if I could pick 3 - but I'll try! Let's see... definitely Autumn's End, and Wrapped in Leaves plus Twin Leaf Loop. I like 'em all! So pretty! Love the samples of Pressed Leaves, Forest Floor, and Twin Leaf Loop. Thank you, Alana, and your other sponsors for a awesome giveaway. These patterns look great! I love Autumn's End and the Ivy trellis mittens. Hmmm hard to chose one ... but Autumns End is first choice and it is tie for buds and blooms and twigs and willows. I would be more likely to actually make buds and blooms but I dream bigger! Wow, can I list my top 3 in each category?! Ok, to pick 1 from each I'll say Autumn's End, Twin Leaf Loop, and Spring Foliage. But it was a tough decision. I've already started the Entangled Vines. Twice actually.... the first yarn I was using had too much cotton in it & was hurting my hands. The yarn I changed to was a lovely Miss Babs that seems to be working out really well! I didn't have that pullover on my list, simply because I prefer cardigans, but I do have some lovely Silky Wool in the stash, so may add that to my list too! Autumn's End - hands down, without question. I was actually looking at these awhile back, and knew I'd have to look into knitting the Ivy Trellis Mitts, the Ivy Trellis Socks, and the Spring Foliage mitts for my mom and MiL... Then again, these don't look overwhelmingly "women only", so I figure I could actually wear them myself! ;-) Beautiful designs! it is hard to choose! But I really like the trellis pattern for both the socks and the mitts... and also Autumn's end. all so beautiful!!! twigs and willows, autumn's end and forest floor. but they're all gorgeous. Thanks for hosting this giveaway! Thanks for hosting such a wonderful giveaway!! Autum Leaves, (of course! ), Twigs and Willow and Entangled Vines. Love the hats too-- Can't pick a favorite! Entangled Vines sweater, Spring Foliage fingerless mitts, and Twigs and Willows cardigan. Thank you for alerting me to this book and to Alana's patterns. They are divine. And your giveaway is stupendous. It leaves me utterly breathless! I could easily imagine making every project in the book, but my favorite patterns are Autumn's End, the Buds and Blooms cardigan, and the Spring Foliage mitts. I love Alana's designs, it's very hard to choose a favourite (or three! ), but I think I will choose Twigs and Willows, Ivy Trellis socks and Pressed Leaves hat. What wonderful, earthy knits they all are! They're all so beautiful! Decisions! Decisions! The Autumn's End sweater you made your daughter is so pretty! Gotta put that on my list! 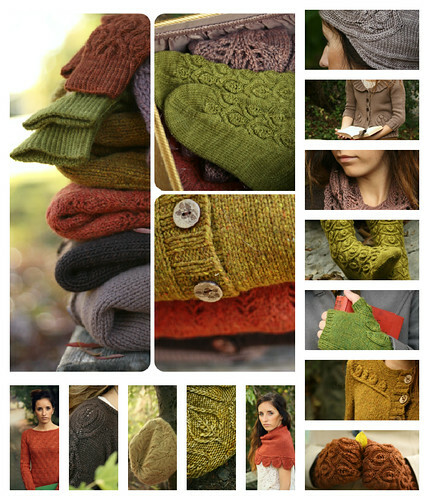 My top 3 picks from this collection are Autumn's End, Ivy Trellis Socks and Twigs and Willows. I can't stop admiring them! My top 3 would be Twigs and Willows, Entagled Vines and Oak Trail. But since I saw your Autumn's End, that might have to be first on my list! I love Buds and Blooms and Twigs and Willows! I love every single design in the book, but will probably go for one of the sweaters first, maybe Autumn's End or Twigs and Willows. Thanks for such an incredible giveaway. You are so generous! I love so many of them, probably the Buds & Blossoms...that collar is divine! OMG what a great giveaway! Maybe I will be lucky this time and actually win. I love Oak Trail! What a great hat. I would actually wear it! I like the Ivy Trellis socks and mittens best. Thanks for the great giveaway. The sweater you knitted is amazing. I want one. Thanks for such a great give-away! What a wonderful giveaway! Twigs and Willows is definitely my favorite, but I also love entangled vines, and forest floor....and, well, pretty much everything in this collection. I so enjoy all of Alana's patterns though. Entangled vines and Autumn's End are so lovely. What a great giveaway. I'll be watching Alana's blog too! Big fan of her work. Entangled Vines is my favorite! I also love Twigs and Willows. O...K...Just 3? Ivy Tellis socks, Autumns End, and Forest Floor. They're all so lovely, but I would probably knit the Twigs and Willows cardigan first! This is such an amazing giveaway! Thank you so much! Honestly, I love the entire book! But I think Autumn's end, the Ivy trellis mittens and entangled vines are my favorites! My favs are the sweaters!! (I'm a sweater girl anyways), but i love the forest hat and mitts too! thanks for the giveaway!! Wow! What a generous giveaway! And what beautiful patterns! Great giveaway and fabulous yarn! I love Entangled Vines, Pressed Leaves and Forest Floor. Autumn's End, Buds & Blooms, and Twigs & Willows are my favorite. Enter me in the giveaway. Amazing giveaway. It is so hard to puck favorites, but I love forest floor, autumn's end and oak trail the best. It really is difficult to choose... Maybe Autumn's end, Pressed leaves and Twigs and willows. Autumn's End and Twigs and Willows are my favorites!OMG and that basket of yarn-WOW! I would be tickled to win any of those fabulous gifts. And now would be the perfect time to start knitting Alana's patterns for fall...and even a chilly spring day! The collection is exceptionally good, all the patterns seem to be there with a good reason. Those patterns are incredible. I love the Twigs and Willows cardigan, Oak Trail hat and Ivy Trellis mittens. I have been Ravelry stalking all of these patterns and faved most of them right away, but my absolute favorites are Autumn's End, the Ivy Trellis socks, and Twin Leaf. Thanks for the great prize packages to you and the wonderful sponsors! I love shawls and my favorite pattern would be the Wrapped in Leaves shawl. I love the Pressed Leaves beret, and since I have twins, the Twin Leaf Cowl is also calling out to me! What a generous giveaway! WOW is all I can say!!!! What a great giveaway!! my favorite is the Buds & Blooms, followed closely by Twigs & Willows. Just gorgeous! Oh, definitely Oak Trail. I love cloches! A beautiful book. My favorite is the Entangled Vines sweater. I would start by making the cardigans, all of them! Autumns end, Entangled vines and Twigs and willows. Thanks for great giveaway. So much fun! Autumn's End and Trellis Socks are great. Of course, so are the rest of them! LOL! I like Autumn's End, Twigs and Willows and the Loop scarf and all that beautiful yarn. Thanks for an awesome giveaway. Hope I win! Ha! I liked them all, but I liked Entangled Vines, Twigs and Willows, and Autumn's End the best. Oh, wow! These patterns are gorgeous! And what an amazing giveaway! I think the entangled vines cardi is my favorite, although I also love Autumn's End. I love that it has that stripe of plan stockinette down the side to keep the pattern from being just too much! The first SWEATER pattern I really wanted to knit was Budds and Blooms but after seeing your Autumn Vines, I'm thinking that may be the first. Now the first ACCESSORY I think I'll be knitting is Oak Trail. Wonderful giveaway! I would choose Autumn's End, Pressed Leaves, and Oak Trail. But they're all beautiful. I'm dying to knit Autumns End! Your Autumn's End is so pretty, I want to make one! The Ivy Trellis Socks are really gorgeous as well. Her patterns are definitely something to enjoy knitting. My favorite is the brown, taupe cardi which I do not know the name of. Her patterns have such a polished look to them. THnak you for this giveaway. What a generous giveaway. My favorites are Autumn's End, Forest Floor, and Oak Trail. Everything is so pretty! I've already bought the book/e-book bundle and have begun plotting! The Ivy Trellis Mittens and Oak Trail will likely be first up on my needles from the book. I need to decide/save/splurge on something delicious for the Twigs and Willows. That was hard! I love all of the designs in this book! But my top three are Buds and blooms, twigs and willows, and the Ivy trellis socks. Thanks for another amazing give-away! My favourites are Twigs and Willows, Autumn's End and Entangled Vines. 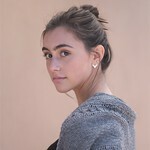 I love Alana's cardigans patterns! These patterns are beautiful and it helps that they are done in colors that appeal to me. My favorites are: Twigs & Willows, Oak Trail & Ivy Trellis Socks. Autumn's End is just lovely, although they are all beautiful. I've always loved Ultra Alpaca yarn and now I'm so happy to see a pattern for the light yarn ! I love these patterns and especially of course Autumn End ! and the hat Forrest Floor and Ivy Trellis socks ! They are all beautiful patterns ! I like Twigs and Willows, Autumn's End, and Oak Trail. Beautiful stuff! I would knit the Oak Trail, the Pressed leaves, and the Autumn's End. ..and then the Entangled Vines. Oh, those ARE gorgeous! Hard to pick a top 3!! I love, love, love the Ivy Trellis socks, the Pressed Leaves hat & Autumn's End.....plus a lot more! I love Twigs and Willows, Autumn's End, and Oak Trail - this entire book is AMAZING! They're all soooo pretty - I especially love Entangled vines, Oak trail and Pressed leaves. The Oak Trail hat is probably my favorite, but they're all so pretty! I love organic/leafy/twiggy designs; this whole collection speaks to my heart. Autumn's End is absolutely my favorite, but Little Leaves and the Twin Leaf Loop are a close second and third! I'm usually not a cardi gal but Autumn's End screams "Knit me NOW!!!" Thanks for hosting such a generous give away! I love Alana's designs! My favorites are Buds and Blooms, Twigs and Willows, and Pressed Leaves. This is a lovely book. My favorite patterns are Twin Leaf loop, Twigs and Willows and the Ivy Trellis Mittens. Thanks for a chance to win. My rav name is janineny2001. Ooohhh so many wonderful patterns! I think I would start with Entangled Vines ... and the Ivy Trellis Socks because I love socks! Such lovely colors! I like Twigs and Willows and Twin leaf loop. Thanks for a chance! Such a beautiful book. I would love to knit most of the patterns. That autumn's end looks gorgeous but challenging! Autumn's End would look fabulous on my daughter! I also really like Pressed Leaves and the Ivy Trellis socks. I love the Autumn's End pullover. I also really like the Spring Foliage mitts. What an amazing giveaway! Your sweater is an inspiration as always. Your work is so lovely!